!! OMG, how cute: Cat on man’s head !! This kitty gets a yummy reward for sitting on this guy’s head all day. How does he manage to stay so skins? I must know his secret. » NEXT ENTRY: OMG, They’re Drunk: Monkeys! 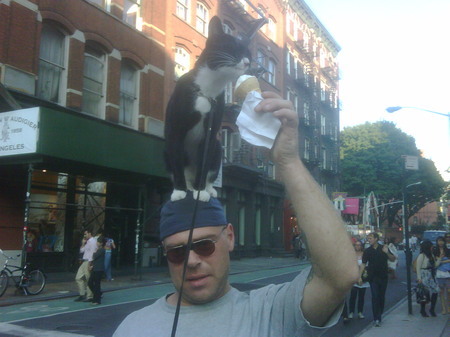 2 Comments on "OMG, how cute: Cat on man’s head"
I took a picture with this dude and his cat when I was ny! so how is Anderson Poopers Wii workout going?